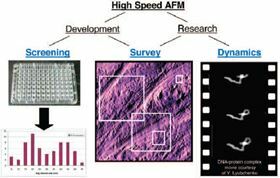 Figure 1: AFM Applications that benefit most from higher imaging speeds break down into the three main categories of survey, screening, and dynamics. When compared to other common microscopy techniques m(optical, SEM, TEM), the atomic force microscope’s (AFM’s) broad potential for nanoscale imaging and characterization of numerous physical surface properties has been somewhat offset by its slow imaging speed. Thus, the AFM has sometimes been seen as a powerful “specialty tool” to use when other suitable techniques are not available. Bruker’s Dimension FastScan™ development team worked with many AFM leaders to understand their research objectives and related enabling technologies, iteratively exploring various design considerations in the pursuit of bringing together the best of all these solutions into one tool. The ultimate result is the creation of an AFM that ideally marries high-resolution performance with rapid imaging. This application note details how the Dimension FastScan AFM accomplishes this ideal.